What’s the point? How to measure type. Thanks to the wonders of digitisation we now have more typefaces to choose from than ever before and they come in an infinite variety of sizes. But it wasn’t always like this. Even more delightfully, the French and the Americans used different names for most of the sizes and no one agreed on the size of a point anyway. It took the introduction of what was originally called Desk Top Printing in the 1980’s for everyone to standardise the points system. Why didn’t printers just use numbers instead of names in the first place? You might as well ask why the human race put a man on the moon before anyone thought of putting wheels on luggage. 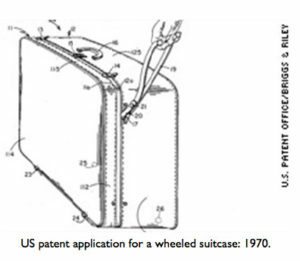 Pictured on the right is the US patent application for putting wheels on a suitcase, dated a few months after the moon landing.